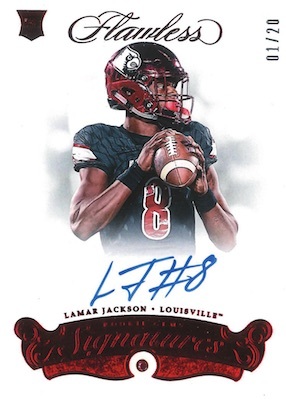 2018 Panini Flawless Collegiate Football is about as high-end as it gets for NCAA football collectors. The premium 10-card-per-box format only consists of autographs, memorabilia cards and gemstone cards. Matching the 2017 release, that means six autographs, two relics and two gems in each box, including past Heisman Trophy winners and All-Americans. Collectors can count on only on-card autographs or cut signatures with print runs capped at 25 copies. 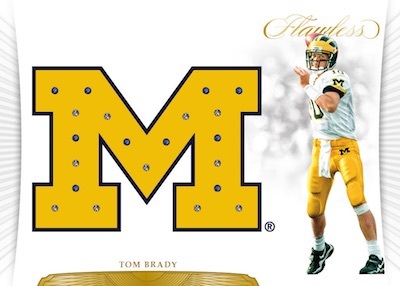 Not just an average base card, 2018 Panini Flawless Collegiate Football sticks with the Flawless style of embedded gems. The Base 3.0 design comes in Diamond (#/20), Ruby (#/10), Sapphire (#/8), Emerald (#/5), or Oversized Diamond (1/1) versions. Adding on-card autographs with the gem for 2018 rookies, the Flawless Rookie Gems Signature cards, numbered to 25 or less, make a strong impression. These offer Ruby (#/20 or less), Sapphire (#/15 or less), Gold (#/10 or less), Emerald (#/5 or less), and Black (1/1) parallels, as well. There are also the all-new, one-of-one Flawless Player Team Gem cards that highlight the school logo using multiple gemstones. 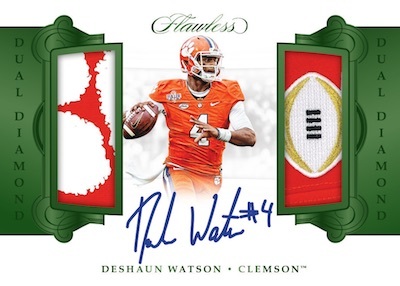 Of course, leading the 2018 Panini Flawless Collegiate Football checklist are the hard-signed Rookie Patch Autograph cards showcasing some of the best first-year NFL players in their college gear. 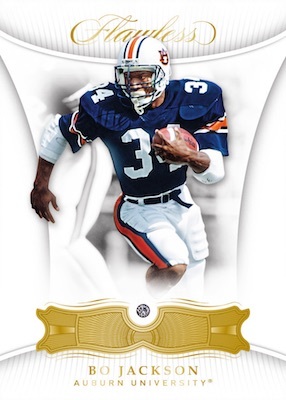 Premium parallels display Conference Patches, Bowl Game Logos or Brand Logos. More on-card content for rookies comes in Rookie Team Slogan Signatures and Flawless Dual Signatures, which also features non-rookie pairings. 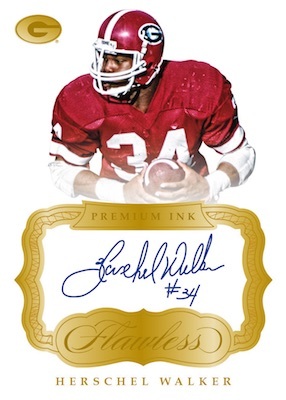 If you want college legends, check Premium Ink for choices like Barry Sanders, Bo Jackson and Lawrence Taylor. In addition, the Dual Diamond Memorabilia Autograph cards sandwich an on-card signature between two patch pieces for a former NCAA great. The majority of the hits mentioned above are issued in Base (#/25 or less), Ruby (#/20 or less), Sapphire (#/15 or less), Gold (#/10 or less), Emerald (#/5 or less), and Black (1/1) editions. 2018 Flawless College Marshall Chase Litton RPA Sick Patch 3 5 Emerald SSP Rare! DERRICK HENRY 2018 FLAWLESS COLLEGIATE ALABAMA PRIME DUAL AUTO JERSEY PATCH 10! Shop 2018 Flawless Collegiate Football cards on eBay. 61 cards. Serial numbered #/20. PARALLEL CARDS: Emerald #/5, Diamond 1/1. 62 cards. Serial numbered #/25. BLACK LOGO PARALLELS: Brand Logo 1/1, Conference Logo 1/1. 11 Silver and 16 Gold parallel cards. 13 Sapphire and 23 Gold parallel cards. 24 cards. Serial numbered #/5. 19 Sapphire and 22 Gold parallel cards. 7 cards. Serial numbered 1/1. PARALLEL CARDS: Brand Logo 1/1, Conference Logo 1/1. Beautiful Cards But the MONEY!..not everyone is Rich..gotta bring those Prices DOWN…getting a Lil Rediculas! Does Panini ever send out a updated list. I know that Polamalu isn’t signing and I’m yet to see a Clay Matthews auto from this year but listed through out the checklist? The checklist is on the Panini site combined with the 2018-19 basketball checklist, just like it was issued last year. The football checklist is presented here as listed. There are two cards for several players in the RPA set because Panini produced two different versions for these players. 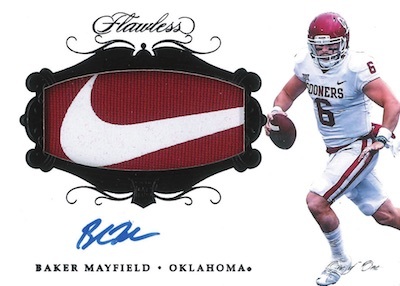 when will the Flawless basketball that are in that checklist on Paninis site be released ? Hey Trey, when do the Panini National Treasures NFL hobby boxes release? Panini is not as quick to formally announce sets like the other brands. No word yet on 2018 but 2017 NT NFL came out in March.